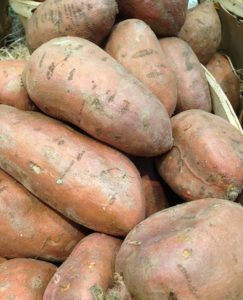 Peel the sweet potatoes and cut into large chunks. Steam till soft, and then mash. I found it takes 20-25 minutes to steam on the stovetop, and 5 minutes to steam in the pressure cooker with quick release. Water saute the veggies, with tamari, crumble in the veggie burgers. Put veggie mixture into the bottom of a 2 qt casserole dish, spread the mashed sweet potatoes on top. bake at 350 for 30 min, uncovered.